The whole conversation got me thinking about the way our strive for better health (or to lose weight, or workout more) often affects those closest to us, and isn't it true that their support can make a big difference? I think it can! Here are some tips for making the transition easier! 1. Insist, Don't Insult: When you're first learning about healthy eating, it's easy to get tunnel vision and forget you, too, used to scarf down oreos. Just because you're now commited to "no sweets," or "no processed foods," or "no meats," doesn't mean that's the only way to healthy living. It also doesn't give you a right to judge others for their food choices. With our husbands, we tend to speak our minds (I know I do) but be careful not to insult your husband's choices, just because they don't align with yours. I think it's better to insist they try drinking a glass of water with dinner, than tell them how crazy they are for drinking Coca Cola. 2. Don't Be A Know-It-All: Again, similar to above- don't go around acting like you're the only one in the world with a clue about eating healthy! One thing I love about the health community, is that there's also something new to learn. ALWAYS. This is especially true for working out. I know with crossfit, I've really had to humble myself to the knowledge Aaron has about muscle groups. Even though he doesn't workout as often as I do (and I could easily think I know more), he's really smart about what exercises strengthen certain muscles and I'm better off LISTENING to him and LEARNING from him, than acting like a know-it-all. *Additionally, this is an area that can strengthen the bond you have with your husband. At the gym, let him show you how to do a few chest presses or whatever you're not comfortable with that he may know about. My brother was big into sports and going to the weight room when he was younger, so I know he has a lot to offer my sister-in-law in this realm (she's never been a gym-goer). 3. Be Creative: Three words: black bean brownies! They're yum and chocolatey, and people often don't realize they're also healthy! Same goes with protein pancakes - he won't miss Bisquick. I promise! New recipes will give you more variety and entice him. 4. Don't Poke Fun: This is something I'm particularly worried about with my sister-in-law because she's tiny, and my brother, well, his weight has always fluctuated dramatically. I know he is sensitive about it when he's heavier, and even though the family jokes with him, we all know our weight can be a really touchy subject. I don't think it's ever a good idea to use insults as a way to "help" someone. A good rule of thumb is the age-old, "If you have nothing nice to say, don't say anything at all. *This is especially important as our husbands are our lifelong mates! It's important to them (whether they admit it or not) that they are pleasing to us, as their wives! You don't want to bruise their ego for the sake of saving a few calories. It's not worth it. Love on our husband all you can. Period. 6. Lead by Example: Besides being creative and cooking new things, being consistent has gotten me the furthest with Aaron. He hears about me going to the gym everyday at work, and it compels him to want to workout too. When I did crossfit in Silver Spring, he was immediately interested. When I make delicious banana-peanut butter protein shakes, he's intrigued. Trust the process and know that as you continue to make health a part of your life, your husband really has no choice but to follow suite, cause it's contagious! Your upbeat attitude (from having some time to yourself at the gym), or your new-found confidence in the bedroom (yep, that happens!) will not go unnoticed! 7. Find out what they like: When we visited my mom's house for Easter, she had a bowl of hard boiled eggs as part of breakfast. Aaron couldn't stop talking about how much he loved boiled eggs and a light bulb went off in my mind: this is something I can prep for him that's healthy, and that he'll actually eat (versus, for instance my egg white casserole, which he wants nothing to do with)! 9. Know that Everyone is Different, Including You and Your Husband - It's a proven fact that men lose weight faster than women (read some reasons why). Men are also better able to perform certain exercises, like pull-ups, but hey, that's life. Different things motivate different people, too. We can't expect that our husbands will take the same approach or have the same methods. Their journey is going to be different; it's going to be theirs. The bottom line is that you don't make your healthy lifestyle the end-all be-all with your husband. Don't be a drill sargent and don't micromanage him! Just do you and get healthy! He'll come around! 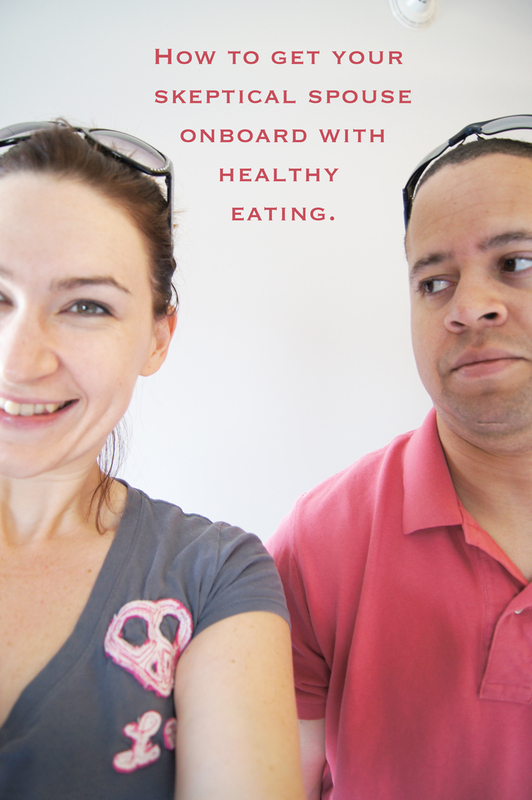 Do you have any suggestions for getting your husband (or kids) onboard with healthy eating? What's worked for you? What hasn't? *Of course there are some health conditions that require a stricter approach to healthy eating/living in your home. If you husband has one of those conditions (or you do!) I suggest speaking with a registered dietitian or doctor about the best approach for you rand your family.